_The Beja Congress held its annual general meeting in Manchester on 26.01.2012, to which all members in the UK were invited. More than 20 members attended the meeting and participated in the discussion. This is the first time that such a big number attended our general meeting. The meeting discussed important issues like support to the Sudanese asylum seekers, the issue of human rights in Sudan, atrocities committed by the regime in eastern Sudan, south Kordofan, Manasir and Blue Nile provinces.We declare our support to any movement, that exists to over throw the regime and establish a democratic Sudan which respects human rights as stated in the United Nations convention. We declare our support for the newly formed body Sudan Revolutionary Front ( SRF ), which is an alliance of opposition groups in the country. It comprises Sudan People's Liberation Movement-North, Justice and Equality Movement (JEM), Sudan Liberation Army, Sudan Liberation Army, apart from the Beja Congress to overthrow the government of President Omar al-Bashir. 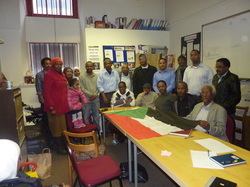 The meeting decided further to organize demonstrations in Manchester and London, to draw the attention of the international community to the atrocities of the regime, that are taking place in Sudanese regions, where the people are struggling for their basic human rights, and in response the government prevents food from reaching their areas , thus using food as a weapon. The international community is called upon to increase pressure on the government to stop its atrocities. All members of the SRF together with other opposition parties are invited to participate. The meeting expressed its gratitude to RAPAR , a human rights organization based in Manchester, for its enormous efforts to get our member and the asylum seeker Mortada free from chains so that he can continue his struggle to achieve safety and justice. The meeting elected a new executive committee under the Chair of Nayla Khalifa with Mariam Abdella as a secretary. to learn more about beja congress click here.